So yesterday after a quick nearly 4k run with my running buddy I hurried home to start getting supper ready. My running buddy was coming over for some post birthday and post run, delicious outdoor suppers. Being obsessed with Pinterest I had several delicious summery recipes pinned off and waiting for me to try. With a fridge full of super fresh Farmers Market ingredients I was so excited to make a somewhat fancy snacks and main dish for my guest. On a side note if you are interested in seeing some of the delicious meals I have been pined, or fun workouts I have found please follow me on Pinterest, just click the button below! 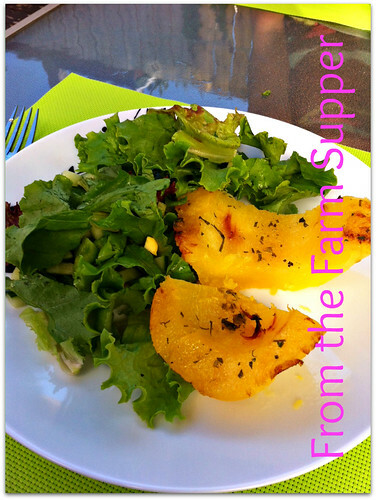 So for supper last night we started with some delicious corn and cilantro crostini, followed by a wonderful roasted honey jalapeno squash, and a fresh garden salad. My only modification to the squash recipe was I had a mystery squash and not an acorn squash but tasty none the less. As for the corn and cilantro crostini I made some modifications, most were based around me bing extra vigilant to be sure I am getting enough protein after cutting meat out of my weekday diet, and because I just didn’t have some stuff. The recipe still turned out super delicious. Preheat BBQ to medium/high heat. Brush corn with 1 tsp of olive oil and flavour with sea salt and fresh ground pepper. Place corn on the grill and cook for about 15-20minutes (depending on your BBQ) until there are some nice chard marks on the corn. Be sure to watch because chard can turn to completely burnt very quickly. While corn is cooking place greek yogurt and feta in a food processor and blend together, set aside. Once corn is done remove from grill and allow to cool slightly. While corn is cooling put sliced baguette pieces on the BBQ and grill until nicely toasted. Once they are toasted, remove from grill and rub garlic cloves on one side of the bread. Slice corn off of the cob. Spread greek yogurt and feta mixture on each piece of crostini, place corn and cilantro on top, and finish with a squeeze of lime. Plate and serve. A special thanks to my dinner guest for taking pictures of the food the other evening. Hope everyone has been having a great week so far, and is looking forward to the long Labour Day Weekend, I know I am! What are you plans for this long weekend? 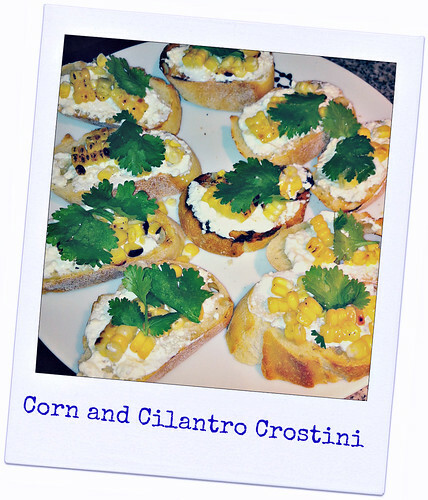 This entry was posted in Food, General and tagged cilantro, corn, crostini, dinner, farmers market, food, greek yogurt, vegetarian by healingginger. Bookmark the permalink.